The development tools necessary for building Java robot programs consist of the Java Software Developers Kit, Netbeans (the Interactive Development Environment), and the FRC Plugins for Netbeans that add the necessary FRC specific components. We have been testing with Java SE SDK version 7+ and NetBeans version 7.2, 7.3, and 7.4. While we believe everything will work with previous versions we have not tested all the combinations. We suggest that you upgrade earlier versions to these to ensure you are running on a tested combination. If you already have Netbeans installed, skip down to "Un-installing the previous version of the plugins". The easiest way to install Netbeans for FRC is to use the JDK/Netbeans co-bundle provided by Oracle. If you do not already have a JDK installed or do not know if you have JDK installed, it is recommended to use this option. You can find the current cobundle installer here: http://www.oracle.com/technetwork/java/javase/downloads/index.html. After installing the co-bundle that matches your platform, skip to "Installing the Netbeans plugins". Only if you already have a JDK installed and did not install the Co-bundle above! Download and install the version of NetBeans that supports Java SE development from https://netbeans.org/downloads/. There are many versions with other built-in development tools, but the smallest one is all that is required. The installation instructions will vary with the type of development system you have. After you have completed the Netbeans install, skip to "Installing the NetBeans plugins". If this is a new installation of NetBeans you can skip this step. If you had a previous version of the NetBeans plugins installed, they must first be uninstalled. If they are installed uninstall them by going to the Plugins window in NetBeans, selecting the 6 FRC plugins from the "Installed" tab, then click "Uninstall" to remove the plugins from NetBeans. After un-installing the NetBeans plugins locate and delete the SunspotFRCSDK directory on your machine. For Windows 7 and 8 users this directory is located in the User directory of the user where you installed NetBeans. Installing from the plugin location - this is the best way to install the plugins since NetBeans will automatically remind you to update when new versions are posted. In this case proceed to the next step in these directions. Installing from your local disk - this method should be chosen only if your development computer doesn't have internet access and you need to bring in the plugins from home or other internet enabled location. In this case, you will not be reminded to update your plugins when new versions are posted, you'll have to watch the FIRST blogs and team email blasts. To choose this option, skip to "Downloading the plugins". Installing the plugins from the internet is best since NetBeans will look for updates when they are available and automatically offer to install them. If you don't have access to the Internet for your development computer go onto the step "Downloading the plugins" to get the plugins and to set a local filesystem installation path. To install from the Internet start NetBeans and choose Tools/Plugins from the menu. Click the "Settings" tab on the Plugins window (1) and select "Add" (2). 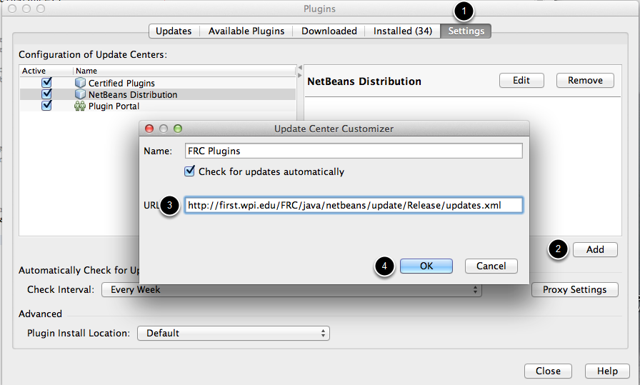 Enter a name for the plugins, like "FRC plugins" and enter the URL "http://first.wpi.edu/FRC/java/netbeans/update/Release/updates.xml" (3). Then click "OK" (4) to add WPLILib to the list of available plugins. 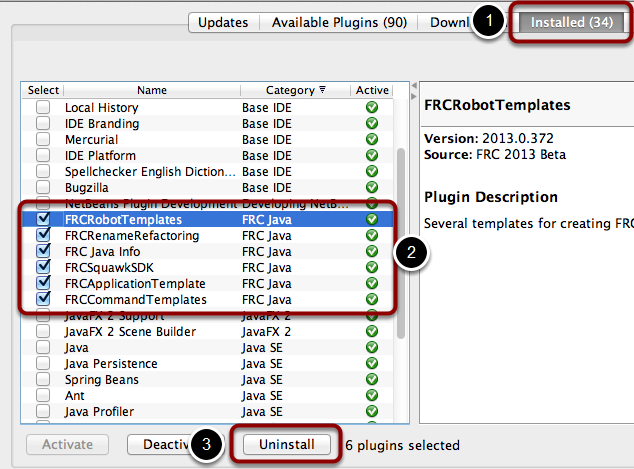 On the "Available Plugins" tab select the 6 FRC Java plugins then click Install. Finish the installation process by continuing through several windows. Then, when asked, select "Restart IDE Now". This will restart NetBeans and the Java for FRC Plugins will be installed. Skip to the step, "Installing the LabVIEW support components". These following steps are for downloading the plugins via a web browser. If you installed the plugins using the previous steps, then skip to "Installing the LabVIEW support components". Using a web browser navigate to the plugin location: http://first.wpi.edu/FRC/java/netbeans/update/Release. You will see 6 .nbm files listed. Download each of these files to a location on your computer. If you are downloading the plugins on a computer that is not your development system, copy the files onto a flash drive and bring them to the development system. 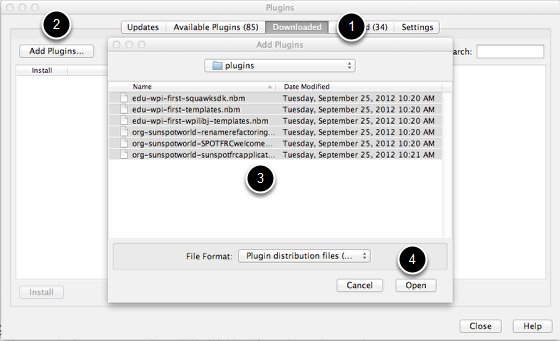 Select the Plugins dialog by clicking on the "Tools" then "Plugins" menu items from the menu bar. Then choose the "Downloaded" tab. Choose the locations where you downloaded them. Select the 6 NBM files that were downloaded as shown in the screen shot above. Click "Open" to add the plugin locations to NetBeans. You should see the 6 downloaded plugins highlighted with the Install box checked on each of them. Click "Install" to add them to NetBeans. Accept all the default options and allow NetBeans to restart when you are given the option. Look out for notices of updates to the plugins and repeat these steps if an update is published. In addition to the Java development tools you need to also install the LabVIEW support components such as the Driver Station, Imaging Tool, and others onto your system. See Installing the 2014 NI FRC Update for details on installing these components.